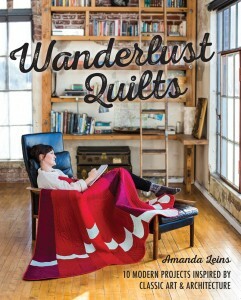 One of the more colorful people we met while attending QuiltCon in Austin this past February was Amanda Leins. 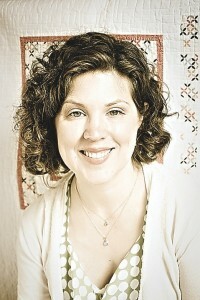 Amanda, a former archaeologist who has turned to quilts to tell stories, began quilting in 2002. 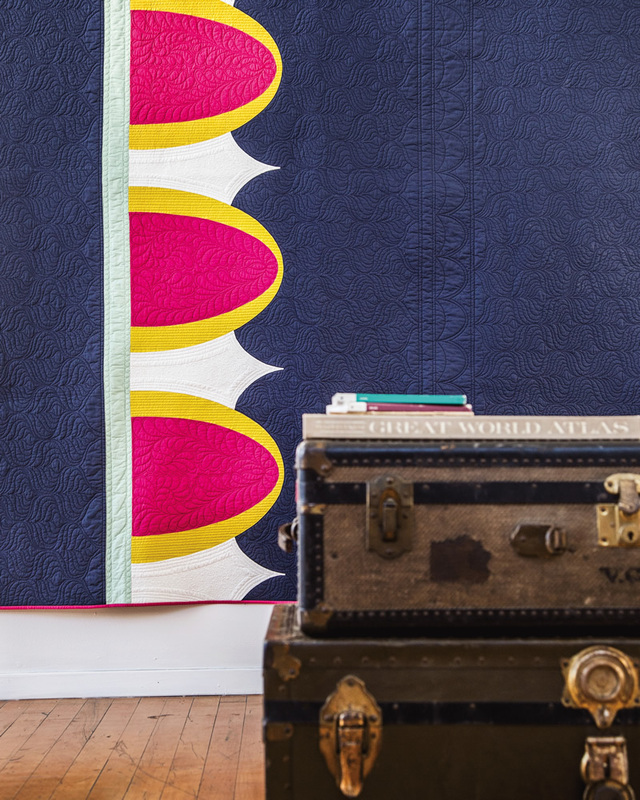 Her quilt, “Eggs and Darts” from her new book Wanderlust Quilts, won First Place in the Modern Quilts category at the National Quilters Association in 2015. One look Amanda’s new book told us all we need to know about her passion for history and architecture. 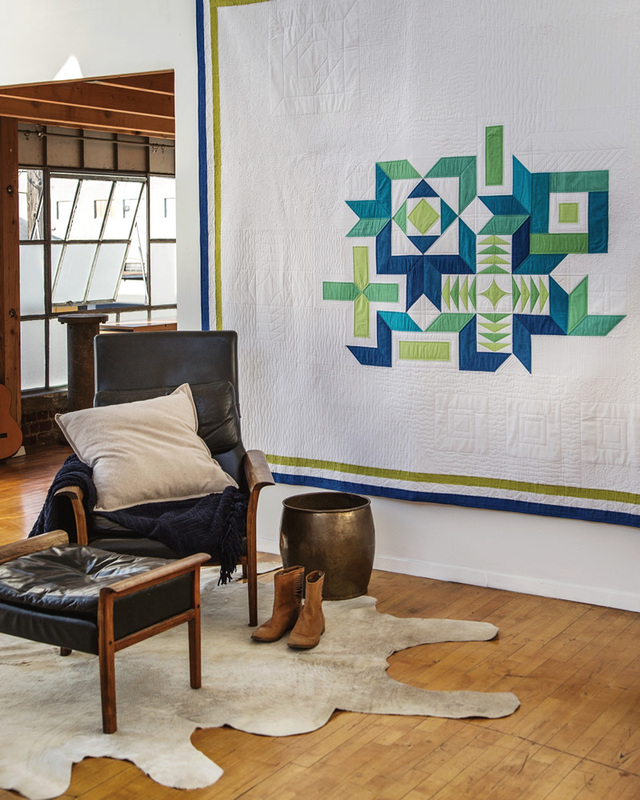 Did you fall in love with quilting immediately or did it grow on you? I made my first quilt at my grandparents’ house on a 1947 Singer. The whole family – parents, aunts, uncles, and grandma – had all used it to make a crazy variety of things and I wanted to be part of that tradition. I knew I loved making things out of fabric, and have always admired embroidery and handmade pieces of any type. It’s the “made-by-hand” legacy I love. After I made that first quilt there was a gap between that and the next because when I went back home, I didn’t have a sewing machine! My first sewing machine was a wedding gift from my husband, a little travel Janome 760. At that point I was hooked because then I could sew whenever I wanted to! What did you find most challenging when getting started? The hardest part for me was sorting out good cutting technique. I just discovered spray starch in the last year, along with a few other techniques that make the cutting more accurate. It wasn’t until I started longarming my own quilts, though, that I realized how much I needed to “straighten up”! I think everyone should have to longarm a quilt or two of their own, just as an educational experience. I shaped up pretty quick after that embarrassing round of realization. 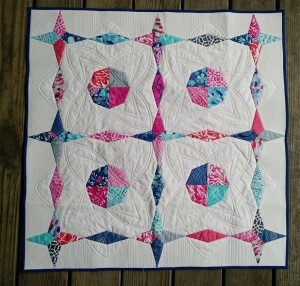 The dreaded “quilt rules” exist for a reason, and being able to know what they are and why they exist means you can then bend and break them and still finish with a solidly constructed piece. 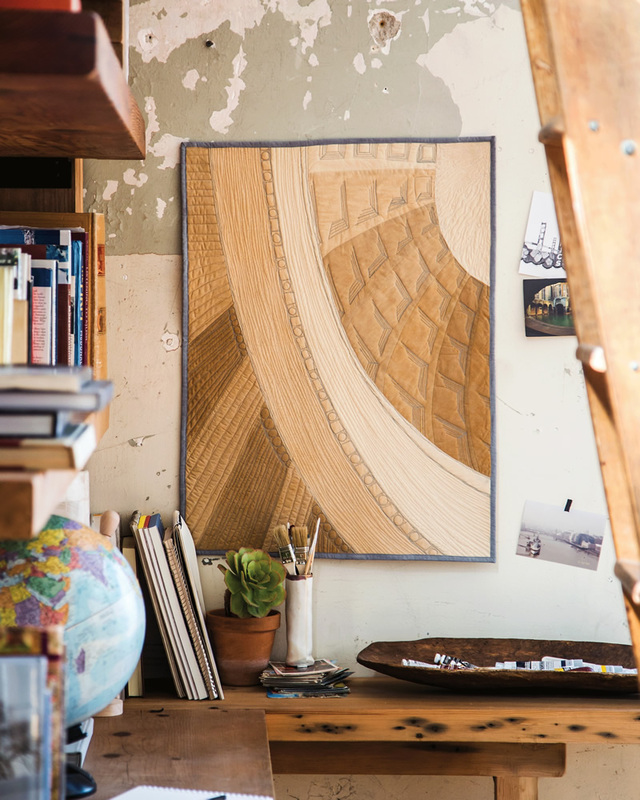 Was there anyone out there in the quilting world who inspired you? The quilters I admire the most are the ones who foster a sense of inclusivity and are genuinely excited about teaching and passing on their technique, those who create an environment that fosters growth. Thankfully, that is quite a few people! Architecture was such a pivotal inspiration for me because it illustrates so many of the elements of good design. 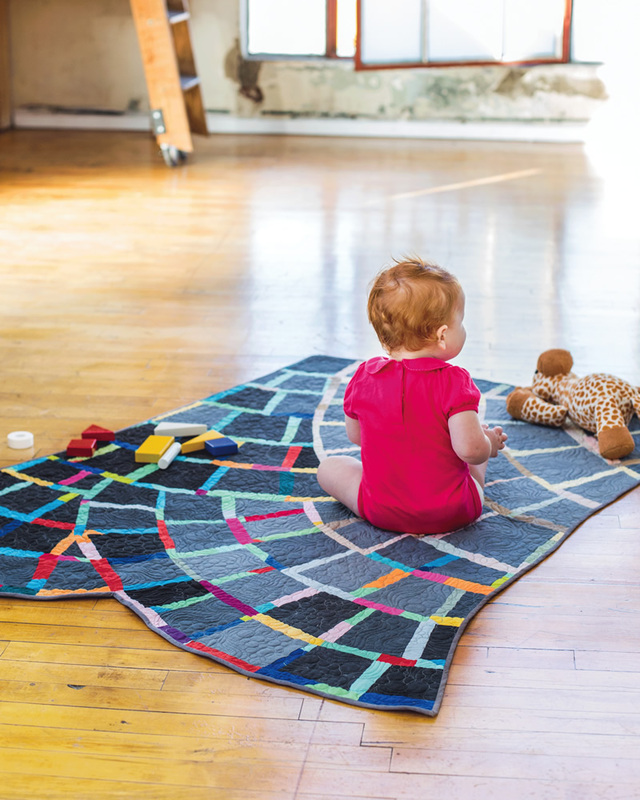 Those same elements also make quilts successful: proportion, scale, balance, eurhythmia. Those elements influenced Renaissance artists. Even the ancient world casts an incredibly long shadow, though we don’t always recognize the origins. Modern architecture is often these same principles in their purest forms, the essential line and shape. Knowing some of those principles can help us in our own journeys as quilters. What led you to write a book? When I wrote the book, I really felt that I had a lot to say about how growing in our work and craft doesn’t mean we have to change our style or appreciation for Modern quilts. 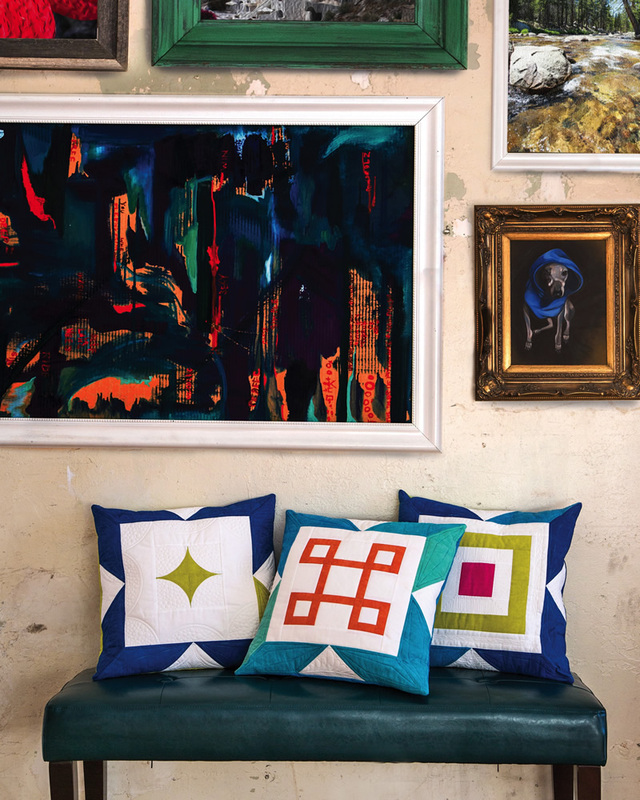 For traditional quilters, I wanted to show that so many traditional quilts have a basis in art from somewhere else. Can’t we all just get along? Additionally, I was hoping to write a book that would inspire people to maybe tell their own stories in their quilts, using these techniques, even if they didn’t necessarily make the quilts from the book. I guess I care passionately about quilting and the people who do it, their having the space to grow and learn and make what they want without fear of being told it’s “not right or doesn’t fit in”. I love all quilts, in all styles, from all periods. Amanda lives in Saratoga Springs, New York, with her husband, two little kids, and one “crotchety old cat”. 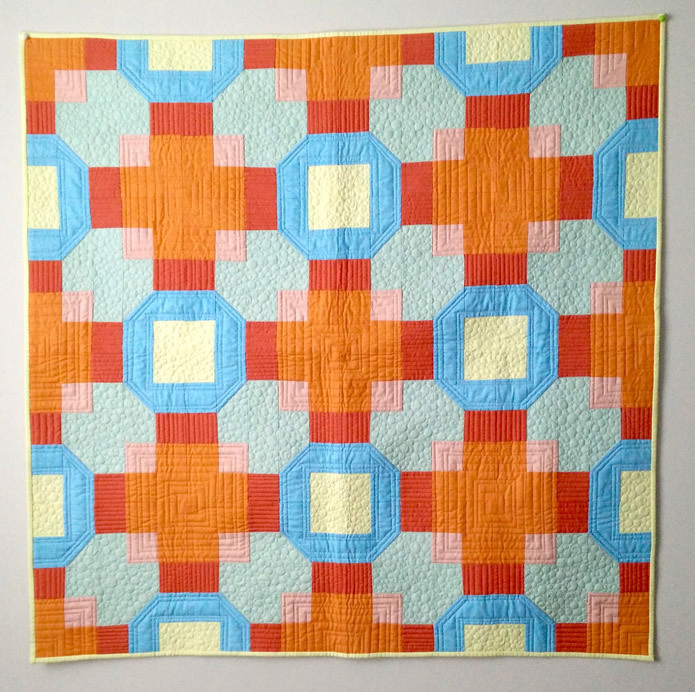 For an excellent primer on using color in quilts, check out her “Star Crossed Quilts” tutorial on Bernina’s We All Sew website. To purchase her books or learn more about Amanda’s free tips, techniques, and information about longarm quilting, visit her blog, Mandalei Quilts. Photography from “Stash Books.” Photographer: Nissa Brehmer.